In a fast-pace modern society, on-demand liquidity is the ideal tool to fulfill immediate financial goals for all occasions. A personal loan that comes with flexible payment terms, low monthly fee and easy application can be a long-term help. Introducing China Construction Bank (Asia) Personal Installment Loan service. CCB(Asia)'s personal installment loan service features easy application and flexible application terms. It is tailor-made with specific liquidity objectives of different potential applicants. Each case is treated individually and meticulously, ensuring all the needs of personal loan are taken care of. The Annual Percentage Rate(APR) of Personal Loan ranges from minimum 3.32% (with cash rebate) or 4.04% (without cash rebate) to maximum 29.46% with repayment period from 12 to 60 months. For Personal Loan amount of HKD100,000 with 12 months repayment period, the monthly flat rate is 0.26% (APR 5.88%), and the total loan repayment amount is HKD103,128. 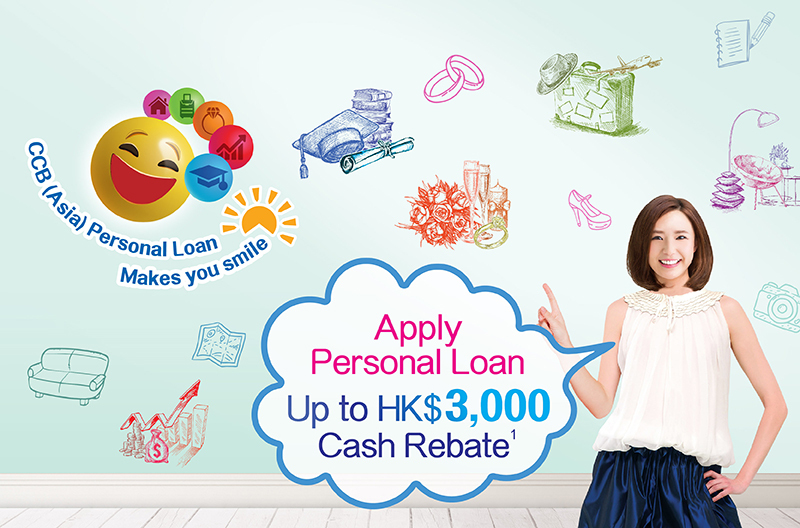 All eligible personal Hong Kong applicants of CCB(Asia) Personal Installment Loan who drawdown the loan and sign up designated Banking Services at the same time may receive a maximum cash Rebate of HK$500. CCB (Asia) Personal Loan provides on-time liquidity with applicants' needs in mind. For more details, feel free to contact our representatives and personal loan centre managers at all CCB(Asia) branches or via phone or website today.